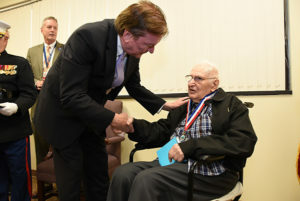 Sam Wiseman, of Cherry Hill, was presented with the Camden County Military Service Medal and award from Camden County College President Don Borden on Thursday, April 19th. 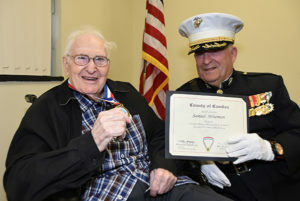 Wiseman is a 99-year-old WWII Veteran that served in the Air Corps from 1942 to 1946. 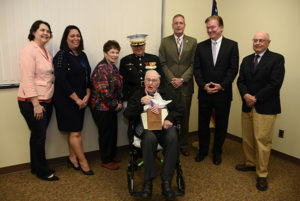 Wiseman, who never attended college, checked off a bucket list item by recently completing Camden County College’s 15-week course on “America’s Gilded Age,” the longest course in the fall program at College’s Center for Civic Leadership and Responsibility. 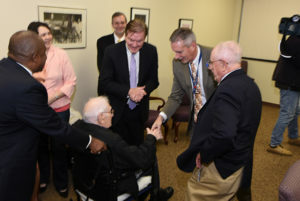 He is looking forward to continuing classes at the college and taking advantage of opportunity he did have after the war.